Chris Stewart was a member of the original Genesis line-up that came together in 1967 at Charterhouse School in Surrey, England. Prior to Genesis he had been the drummer in The Garden Wall, a short-lived group formed by Peter Gabriel and Tony Banks. Although Peter had started out as a drummer he had quickly become more interested in singing and so Chris took over the drum stool. Pop guru Jonathan King soon became interested in Genesis after he was given a demo tape that Peter Gabriel, Tony Banks, Anthony Phillips and Mike Rutherford had recorded at a friend's makeshift studio in Chiswick. He asked them to record four of their songs at Regent Sound Studios in London and was thrilled by the results, offering them a publishing contract with an advance of �10 each. When it came to recording the band's first single they needed a drummer and so Chris was invited to join. Genesis went in to Advision Studios in August 1967 to record Where The Sour Turns To Sweet as their first single. Perhaps through a combination of nerves and inexperience the recording did not work out as well as had been hoped and was ultimately never released. The band tried again by writing some new material which they thought gave them a more original approach but Jonathan King didn't like these songs as much. Worried that they might lose the interest of their mentor, Peter and Tony set about writing a song that sounded like the Bee Gees. The resulting number was called Silent Sun and was released as the first Genesis single on 2nd February 1968. A follow up single, A Winter's Tale, was released on May 10th 1968 but neither single charted despite some good reviews and a reasonable amount of air play. At the behest of Jonathan King, Chris was offered the chance to leave Genesis after the second single. Chris' parents were keen that he completed his education and as his involvement with the band had been great fun rather than a serious career move, Chris accepted the opportunity. He soon moved off to pastures new � pastures being the key word here because Chris became interested in farming and started working as under pig-man on a farm. He was supposed to work there for six months but enjoyed it so much that he stayed for over a year! The next twenty years or so saw Chris drumming for Sir Robert Fossett's circus, shearing sheep in Sweden and working on a farm in Sussex. Eventually he realized a long-standing ambition by moving out to Spain with his wife Ana to run their own farm in the mountains near Granada. 1999 saw the publication of Chris' book about his experiences of setting up a new life in a foreign country. 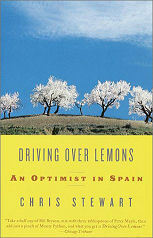 Driving Over Lemons told the story of how Chris set up home in Spain to farm sheep and oranges and it went on to become an international best-seller. The 'sort-of' sequel A Parrot In The Pepper Tree followed in 2002 and continued the success of the first book. 2006 sees the publication of Chris' third book The Almond Blossom Society which has already received critical acclaim. Chris hasn't lost touch with music � he now plays guitar and has had the occasional go at playing the drums again. He also attended a Genesis reunion dinner in London in 1998 and was particularly pleased to catch up with his old friend Anthony Phillips from the band's original line-up. 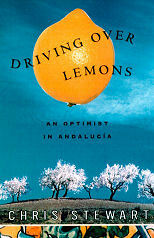 To complete the link, Driving Over Lemons also included back-cover text written by Peter Gabriel. Chris has also been involved as a contributor for two books published in the Rough Guides series � the Rough Guide to Andalucia and the Rough Guide to China.